Get on board and enjoy a wonderful evening while cruising past London’s fantastic landmarks. All the food is prepared on board where the kitchen offers a mouth-watering, four course, á la carte menu. You get a welcome cocktail and you can “dance beneath the stars”, or just relax while enjoying the live band, all this on this amazing Bateaux London Dinner Cruise. Tie, suits or dress are not mandatory. Casual and business casual will do. Jeans, shorts, & sneakers are not allowed. - Your voucher/e-tickets will be sent to your e-mail address. - On rare occasions boarding time may be delayed by up to an hour with very short notice. However, boarding time will never be earlier than 6:45pm. - Children under 13 years are not allowed on this tour. 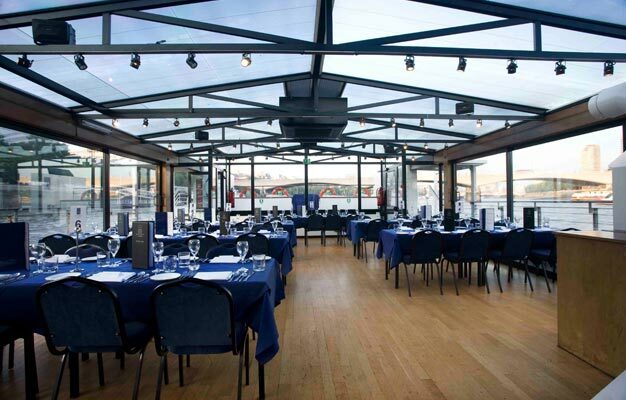 - Bateaux London Dinner Cruise ends at the Embankment Pier.